Can you tell us where you saw it (city, state)? Because that looks like quite a find and someone is going to wish it had sprung up in their neighborhood (including me). It looks like a Japanese Maple called a Moon Maple. If you managed to find one for sale, it would cost quite a bit. Look around for the adult trees (trees because it takes two) in someones front yard. Its surprising the number of people who mistake them for marijuana plants but you would be disappointed if you smoked it. I have Japanese maples, including Moon Maples, and more than one person has asked why I'm growing my 'pot' on the front porch. The other two plants are Lupins. Thanks for the reply! This is actually in Chicago, IL. It looks like whatver adult tree was there previously has been cut down. These must be from seeds that randomly took root. I am guessing the cut-down trees must have been the parents because there doesn't appear to be any maples around. I will take another look after work maybe I should rescue it before someone thinks it's marijuana and destroys or smokes it haha would make a nice addition to my yuka plant in my home! Would you just cut a branch or the stem base in order to propagate it? I don't want to injure it in transport! I don't think a Moon Maple has leaves cut to the centre? This appears to have a regular 7 leaflets but I see a small leaf has 5. The form is similar to Aesculus but the stems are too thick. I think the smaller plants are a younger version of the larger one. 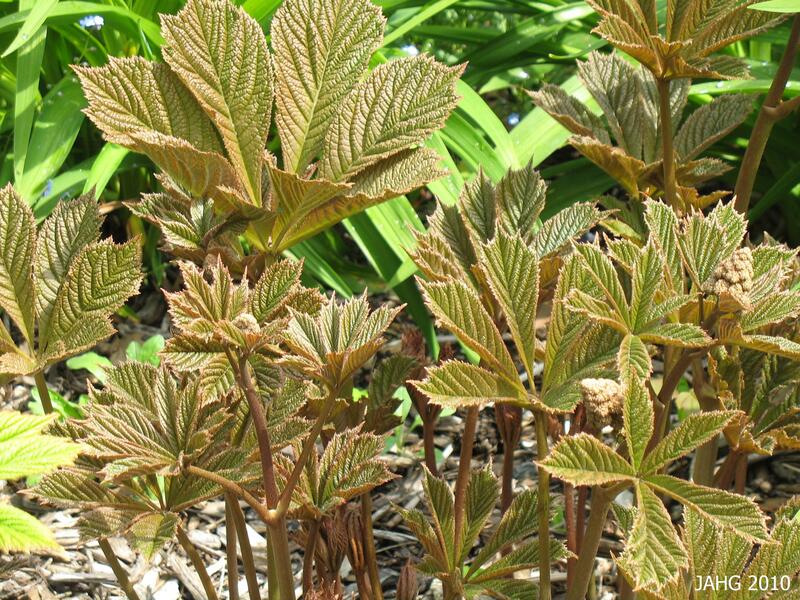 Rodgersia aesculifolia looks much like it, but the leaves don't form a full circle. The leaves don't look to have fully opened so they might 'round up'. I would like to see the leaves when the are fully open. I thought Aesculus too, Janet, because it reminded me of horse chestnut. But could it be red buckeye or ohio buckeye? The stems on those two do look thick enough Sue! The one problem is they both are showing all leaves with 5 leaflets, others do have 7 though and those two might vary as some do. I was wondering if the plants were growing off the roots of the tree cut down, or the seeds dropped from it. Aesculus with 5-7 leaflets ..
62. Buckeyes (Aesculus species) LEAVES: Opposite, palmately compound (the leaflets arranged like spreading fingers), native buckeyes have 5 leaflets, Horsechestnut has 7, leaves to 15" long, margins toothed. I have a Horse Chestnut tree, it doesn't resemble that. They seem to be growing near the stump. If these photos help. I answered that question this morning on my tablet and then got in my car drove 200 miles home. Lots of time to think ....I started wondering if that was Aesculus. For some reason, in my early morning sleep depraved pre-coffee state of mind, I thought that was a street grate, not a tree ring. Completely spaced the tree stump. Sorry Junker but I have to retract my first ID. No Moon Maple. My mother was born in Chicago - there used to be a lot of Chestnut trees there. Just the common edible Horse Chestnuts. 5 - 7 serrated leaflets coming off a central stem. It looks close, but not sure it's that. Are we sure it's not cannabis? I took photos of the newly opening leaves on my Horse Chestnut tree today, they are pretty much like yours. It's a huge tree. I found a seedling which has leaves about 2 inches long, they look the same but smaller. The smaller plant in your pic doesn't have the drooping leaves like a seedling has when opening, they might have come from the roots. It's late here, tomorrow if I download my photos I'll post some pics. Absolutely not cannabis. The horse chestnuts here are coming into leaf and I'm sure that's what you have. I'd say it's regrowth from that stump. Here's my Horse Chestnut leaves just opening .. The seedling which obviously escaped my attention last year, the leaves are around 2" long at this stage so you can see how the stem looks quite thick in a photo. Hmm looks similar but not the same. Here's an updated photo. Now that I can see the stems properly, they do look like Rodgersia aesculifolia! I'm not so confident about the leaves, they need to fully mature. I don't know what else it could be. It could be Rodgersia pinnata .. I have Rodgersia pinnata but it's very slow to grow .. Here's some more detail with more growth and not just lower leaves. The top leaves look different than the bottom ones. The top leaves have opened more, the other larger ones have still got their edges curled under. The other lower leaves are smaller from newly shooted growths.